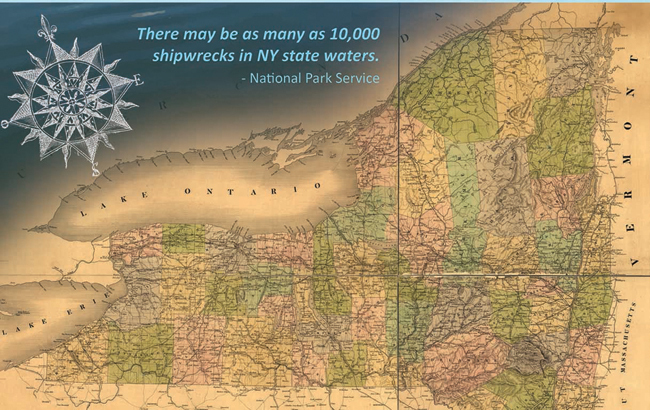 The “Great Shipwrecks of NY’s ‘Great’ Lakes” exhibit, developed by New York Sea Grant (NYSG) for the 2014 Great New York State Fair, is now on a multi-state educational tour. The Great Shipwrecks exhibit was modified as a traveling exhibit beginning in January 2015. Exhibit components include interpretive panels highlighting shipwrecks in Lake Ontario, Lake Erie, Lake Champlain, the Finger Lakes, Lake George and the St. Lawrence River; videos; and a newly-built replica of the ‘turtle ship’ Radeau purposely sunk by the British in Lake Champlain in 1758. Appearing for the first time at the Tyler Art Gallery in Penfield Hall Library at the State University of New York at Oswego, college officials noted, “This Great Shipwrecks exhibit offers students and the greater community a distinctive learning experience focused on New York’s unique maritime history.” As a teaching gallery regularly used by art classes and a training base for museum studies program students, Tyler Art Gallery provided an excellent location for the exhibit to begin its travels. The exhibit has also been showcased at such sites as the Milton J. Rubenstein Museum of Science and Technology in Syracuse, NY, and the Lake Champlain Maritime Museum in Basin Harbor, VT.
An evening program by NYSG on “The Future of NY’s Maritime History” opened the exhibit at the Lake Erie Seaway Trail Visitor Center in Hamburg, NY; highlighting three waterfront initiatives in NY: Dive the Great Lakes Seaway Trail, the New York State Underwater Blueway Trail, and National Marine Sanctuary Program. During its inaugural year of travel, the Great Shipwrecks exhibit was viewed by well over 40,000 divers, maritime history buffs, and shipwreck enthusiasts. The 2016 exhibit tour includes stops in Pennsylvania; SUNY Central,Albany, NY; and the Seaway Trail Discovery Center in Sackets Harbor NY.